Normally I wouldn't have bought this combo from Starbucks except they were giving out 5 bonus stars, which goes a long way toward keeping my Gold Card status. 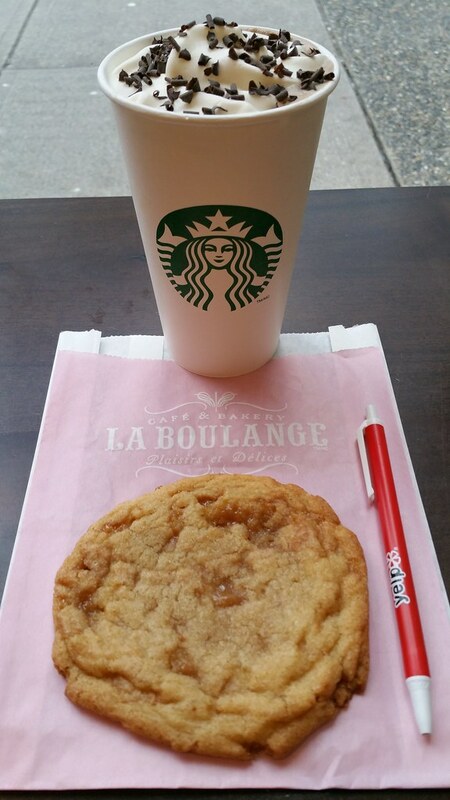 The offer (good Feb-12 to Feb-14) is: "Pair your handcrafted Mocha beverage with any cookie, and earn Bonus Stars on top." Cookies are a couple of dollars for a big but thin cookie. I went with the ToffeeDoodle. For mocha, I asked which one qualified and one person at the counter said "any", and the other suggested peppermint. Upsell? Anyway, I went with peppermint and they automatically placed the order for a grande. TIPS: Ask for extra hot. Cool whipped cream on top (with chocolate sprinkles) can really cool down your drink, which is sort of like a weak hot chocolate with coffee flavour. The cookie was thin but broad (and still not worth even $1), and very chewy. Also quite sweet, enough to give a faint burning sensation (the sort you can get with something too sugary) at the back of the throat. Overall, good for stars, but sub-par in taste and value.